1) (De Best). 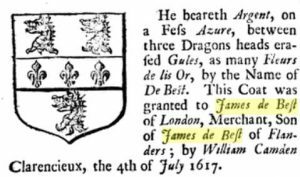 (London; granted 4 July, 1617, by Camden, Clarenceux, to James De Best, of London, a free denizen, son of James De Best, of Flanders). Ar. on a fesse az. betw. three dragons’ heads erased gu. as many fleurs-de-lis or. Crest—On a mural coronet or, a fleur-de-lis per pale gold and az. betw. two laurel branches vert. 2) (Park House, co. Kent). Sa. two crosses crosslet fitchee in chief and a cinquefoil in base or. Crest—An ostrich ar. issuing out of a mural crown, in the beak a cross crosslet fitchee, or. 3) (Lord Wynford). Sa. a cinquefoil within an orle of crosses crosslet or, on a canton of the last a portcullis of the first. Crest—Out of a ducal coronet or, a demiostrich rising ar. in its beak a cross crosslet fitchee gold, gorged with a plain collar and pendent therefrom a portcullis sa. Supporters—Two eagles reguard. wings elevated, each standing on a Roman fasces, all ppr. Motto—Libertas in legibus. 4) (Kent). Per pale ar. and sa. a cross patonce counterchanged, and in dexter chief a rose gu. 5) (London). Erm. three bucks’ heads erased gu. armed or. Crest—A peacock with wings elevated or, holding in the beak a serpent reflexed over the neck ar. 6) Ar. a chev. gu. betw. three sheaves of arrows, two in saltire, and one in pale of the last. Crest—A griffin’s head erased sa. 7) (Elmswell and Little Driffield, co. York). Gu. a Saracen’s head couped at the neck ppr. navally crowned or, betw. eight lions’ gambs chevronways in pairs, paws inwards of the last. Crest—A cubit arm vested gu. cuff or, holding a faulchion ppr. 9) (Boxley, co. Kent). Sa. in chief two cross crosslets fitchee and in base a cinquefoil pierced ar. Crest—A demi ostrich ar. issuing out of a mural crown in the beak a cross crosslet fitchee or. Motto—Sola cruce. 10) (Chilston and Wierton, Kent). Sa. two cross crosslets fitchee in chief, and a cinquefoil pierced in base or, a martlet for diff. Crest—Out of a mural crown or, a demi ostrich ar. holding in the beak a cross crosslet fitchee of the first. 11) (Fun. Ent. Ire. 1652). Ar. a fess gu. betw. three leopards’ faces in chief and as many martlets in base. sa. 12) (William Best, Esq., of Park House, co. Kilkenny, d. 11 July, 1640, second son of Richard Best, Esq., of Bybrooke, co. Kent., Fun. Ent. Ire.). Sa. a cinquefoil betw. eight cross crosslet fitchee or, a crescent for diff. 13) (Compton, co. Surrey). Ar. a chev. gu. betw. three sheaves of arrows, two in saltire and one in pale of the last. 14) (Sedgley, Bilston, and Wednesbury, co. Stafford, and Elmley Lovet, co. Worcester). Ar. on a chev. gu. betw. two martlets in chief sa. and a book closed in base ppr. three pheons or. 15) (London and Kent). Per chev. nebulee erm. and ermines, three stags’ heads erased or. Crest—Out of a ducal coronet gu. a demi peacock, with wings displ. or, holding in the beak a snake ppr. entwined round the body. 16) (Worcestershire). Sa. a cinquefoil betw. eight crosses crosslet or. Crest—Out of a ducal coronet an ostrich’s head betw. two wings ar. in the beak a cross crosslet or. 17) Sa. a lion ramp. ar. on a bordure or, eight cinquefoils az. 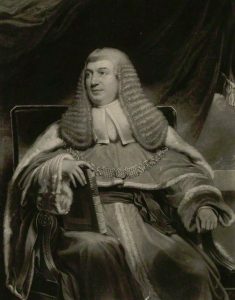 18) (Haden-Best, Haden Hill, Rowley Regis, co. Stafford: exemplified to George Alfred Haden Best, Esq., upon his assuming by royal licence, the additional surname of Haden). Quarterly, 1st and 4th or, on a chev. betw. two martlets in chief, and a pheon in base gu. three boars’ heads couped of the first, for Best; 2nd and 3rd, sa. on a pile betw. two mullets of six points in base are, a human leg couped at the thigh az., for Haden. Crest—1st, Best: In front of a rock ppr. thereon a pheon az. a boar’s head couped or; 2nd Haden: In front of a cubit arm in armour, the hand grasping an arrow in bend sinister, a morion, all ppr. 19) Grande-Bretagne – De gueules à une tête d’homme de carnation le front ceint d’une couronne navale acc de huit pattes de lions d’argent cantonnées 2 à 2 l’une sur l’autre celles à dextre en barre celles à senestre en bande Cimier un bras paré issant en pal tenant un badelaire en barre. English: (Great Britain) Gules with a head of a man carnation, crowned with a naval crown, accompanied by eight lion gambs argent, two in each quarter of the shield, arranged one over the other, those to the dexter – placed bendwise sinister, those to the sinister – placed bendwise; Crest: an arm clothed [dressed], issuant palewise, holding a badelaire bendwise sinister. 20) Hollande – D’argent à quatre fasces de gueules (Arm V G). English: Argent four bars gules. 22) Bois-le-Duc – De gueules à deux losanges d’argent 1 en chef à senestre et 1 en pointe au franc-quartier d’argent ch d’un oiseau de sable. English: Gules two lozenges argent, 1 in the sinister chief, and 1 in base, a canton argent charged with a bird sable. This surname originates in the nickname “the beast”, which one author believes was not used in an insulting manner. This comes from the Middle English word beste or best. It may be an occupational surname that refers to someone who worked as a herdsman. Early notables include Richard le Beste recorded in Cambridge in 1273, William Best, Walter Best of Oxford, Thomas Best recorded in 1379, and Agnes Best in 1379. Robert Beast, or Best, was the sheriff of Norwich in 1495. A Matthew Topham married Hannah Best in 1732 in St. George’s Hanover Square. The motto for this surname is Haud nomine tantum, which means “Not in name alone”. Richard Stuart Best, member of the House of Lords was created a life peer as Barton Best of Godmanstone in the County Doreset in 2001. One of the first settlers in the New World who held this surname was Christopher Best, who arrived in the state of Virginia in 1623. A William Best, a resident of Virginia, asked for tax relief in 1624 on account of an Indian attack (the Jamestown Massacre?) that occurred two years earlier, described himself as a poor farmer. Hi, my name is Jeff Best of Alabama.My grandparents Also Best s were tobacco farmers around Dunno.C. Thanks for the fascinating insight into my heritage!